You are in for a treat with this Lemon, Garlic & Parmesan Roasted Broccoli recipe! Broccoli is one of my go-to side dishes. It’s something that is quick and easy, the kids actually like it, and it’s packed with nutrition. Did you know that broccoli is one of the few veggies that actually contains protein? It’s also got vitamins A, C, potassium, fiber…the list goes on! But we like these “little trees” mostly because they’re delicious. Roasted broccoli has a great crunch and roasting really brings out the flavor. I have found that even when people think they don’t like broccoli, once they try it roasted they change their minds! And then once you add the flavors of garlic and lemon and parmesan…you’ll put this dish on permanent rotation. I even snack on the leftovers cold from the fridge! Now I’m going to let you in on a little secret here…many people don’t know this, but it will change your life, I promise! You can roast FROZEN BROCCOLI!!! Yes, it’s true. Get yourself a big old bag of frozen broccoli florets and then you have zero prep to do for this side dish. You just open the bag and dump it onto the pan. Now you have a super simple side dish that goes with everything. Your welcome. This dish couldn’t be simpler, whether you chop up some fresh broccoli or just use a bag of frozen. Preheat the oven to 425° and spread the broccoli florets on a large baking pan with sides (also known as a jelly roll pan.) A quick drizzle of olive oil and a little minced garlic…then pop it in the oven for 15- 20 minutes. Once you remove it from the oven, add a sprinkle of parmesan and a squeeze of lemon. While this dish is fantastic with fresh lemon, garlic and parm, believe me when I say it is still so good with bottled lemon juice, grated parmesan and minced garlic in the jar. And those shortcuts make this a dish you can have on the table any night of the week. 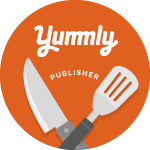 Also, I wanted to let you know that I have added the Yummly website button to my site and posts! Are you familiar with the Yummly site? It’s so great if you love recipes and cooking and are always looking for new inpiration. From the Yummly site: “Yummly puts every recipe in the world in your pocket. The most powerful recipe search, the recipe sites you love, your digital recipe box, recipe recommendations just for you, and a smart shopping list – all with you wherever you go.” So check it out, and I’d love for you to “yum” my recipes by clicking the button below and sharing it on the Yummly network. A quick, easy side dish, packed with flavor and nutrition! Spray a large baking sheet (use a pan with sides, also known as a jelly roll pan) with cooking spray. Spread broccoli florets on pan and drizzle with olive oil. Sprinkle the garlic over broccoli; add salt and pepper to taste. Roast in oven 15 - 20 minutes, or until the edges start to get brown and crispy. After removing from oven, sprinkle with lemon juice and parmesan. Enjoy! I could eat this everyday, and often snack on leftovers cold from the fridge! Leslie, I hope you loved the broccoli as much as we do! roasting frozen broccoli? You may have actually changed my life!!! my hero!! Kayla…Yes this is a great clean recipe…replace the cheese with some crushed red pepper to give it some kick! We’ve roasted broccoli with olive oil and parmesan, but I don’t think we’ve ever added lemon juice before. Excited to try it out! Stacy!! A) This looks delish!! And B) I’m SO glad you shared that tip about being able to roast frozen broccoli – who knew?! YAY!!! I loved roasted vegetables but I’ve never roasted brocolli. Definitely trying soon! Let me know how you like it Sarah! This looks delicious! I’ve been looking for ways to make broccoli so that my husband and I can both enjoy it, and I think this may be the recipe! Thank you for sharing! This looks so good! I haven’t had broccoli in a while and I love it. You can roast frozen broccolli!?!? Life changing haha. Definitely keeping this one in my back pocket! Looks delicious! Thanks for sharing!! It is as if you peaked in my fridge and read my mind…. Had a broccoli laying around there for tonight but no inspiration, so this is perfect. Thanks so much! Great…I hope you love it! Let me know how it turns out Jill; I hope you love it! This looks delicious! My hubby is vegetarian so I am always looking for great recipes! Thank you so much for something that’s simple and mom friendly! I hope you and your husband love it! I’ve also added some crushed red pepper to spice it up.